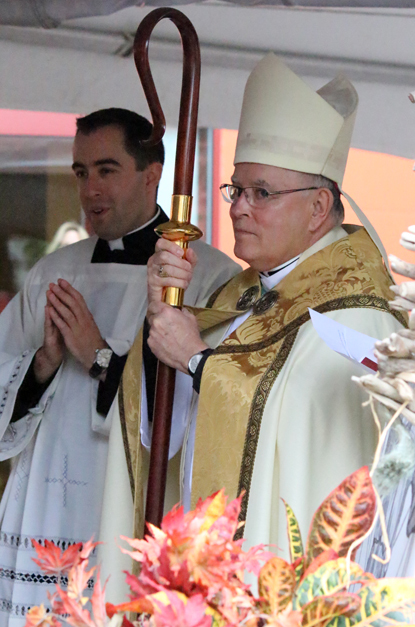 Oct. 4 was a perfect day for the dedication and blessing of St. Francis Villa in Philadelphia’s Kensington section by Archbishop Charles Chaput. By no coincidence it was the feast of St. Francis of Assisi, who would very much approve. 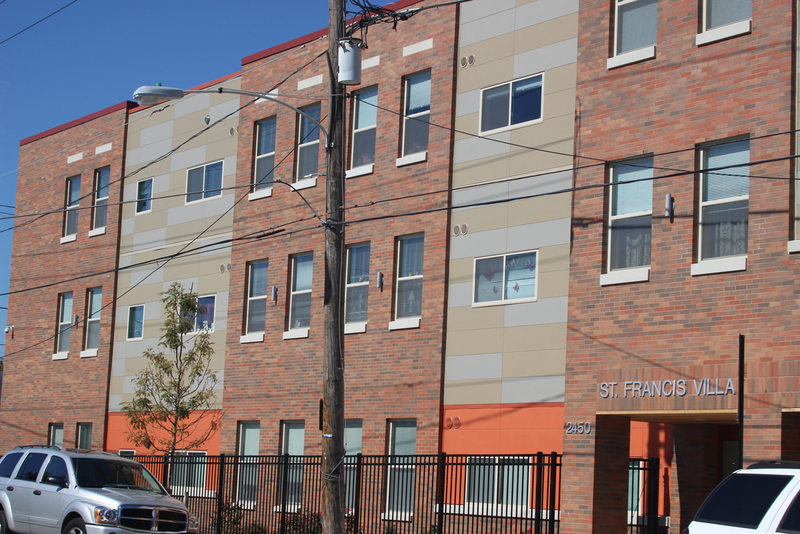 St. Francis Villa is the latest affordable housing facility for older adults established by archdiocesan Catholic Health Care Services. It consists of 40 apartments with bedroom, bath and living space with kitchen. Most occupants, already in place, are single but there are a few couples. “It’s a dream come true,” said Franciscan Father Michael Duffy, who has been feeding the poor at nearby St. Francis Inn for the past 29 years. St. Francis Villa really was something he thought about a decade ago, and took to the archdiocese, but such a complex undertaking involving the archdiocese and federal and local government agencies couldn’t get off the ground immediately. Kensington has been for many years a very poor neighborhood, and while it is clearly being redeveloped, there are still many people in the area who live in deep poverty. Father Duffy saw a special need for decent senior housing because the young, even if they are poor, can have hope for the future but the elderly cannot. St. Francis himself wished his followers to practice poverty, to have nothing. But even he, Father Duffy noted, in his later years came to see that as his brethren grew old they needed a safe home. In his remarks, Archbishop Chaput complimented Father Duffy and Catholic Health Care Services for seeing the project to fruition. Addressing the residents, the archbishop told them St. Francis Villa is more than a building and more than housing. “It is a home,” he said, urging them to help build community among themselves. St. Francis Villa is located on the 1900 block of East Haggert Street at the site of a former factory that burned down in 2010. Total cost of the project was $14.2 million, with more than $12 million obtained through low-income housing tax credits from PNC Bank. The Philadelphia Housing Authority also contributed $1.8 million, and pledged an additional $9 million in future rent subsidies. 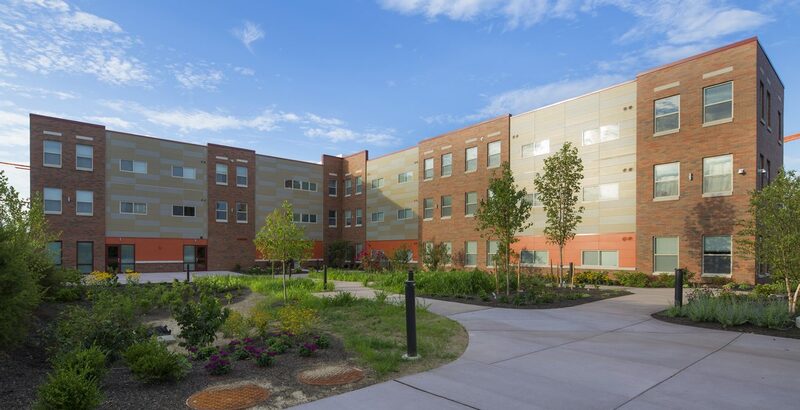 “The rent subsidies will enable us to reach down to the most vulnerable senior citizens in our community,” said John Wagner, deputy secretary and CEO for archdiocesan Catholic Health Care Services. Heather Huot, assets manager at Catholic Health Care, thought it appropriate that the facility named for St. Francis was dedicated on his feast day. She called attention to the great diversity among the residents of the beautiful new apartments. This was also noted through the diverse readings from Scripture at the ceremony, which included English, Spanish and Vietnamese readings. According to Wagner and Huot, ethnically the new residents of St. Francis Villa are mostly Hispanic, Vietnamese, African American and non-Caucasians, in that order, which really reflects the current makeup of the neighborhood, although residency is not limited exclusively to Kensington and the surrounding area. Wherever they come from or whatever their ethnicity, they are clearly thrilled with their new home. “I love it,” said Mel, who is African American. “I was living in somebody’s basement before this.” Now he’s got a great apartment all of his own and all within his modest budget. St. Francis Villa joins two other affordable senior housing apartment facilities already operating under archdiocesan auspices. They are St. John Neumann Place in South Philadelphia and Nativity B.V.M. Place in Port Richmond. Next year St. John Neumann Place II is scheduled to open and St. Rita Place in South Philadelphia is in the pipeline. In the planning stages is a suburban location, probably at St. Joseph Parish in Collingdale, according to Wagner. As Archbishop Chaput exhorted, they won’t just be housing developments, they will truly be homes.